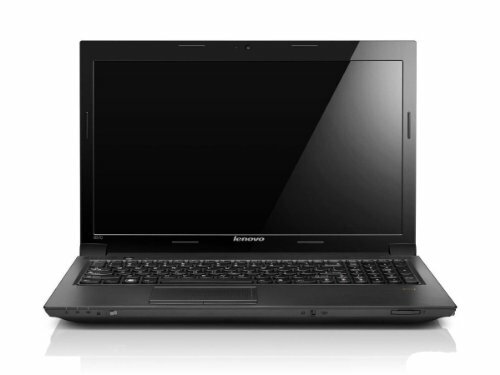 The Lenovo B570E2 laptop has a 15.6" display and is priced at around £320, with a decent spec despite it's low price. Processing duties are provided by the Intel Core i3-2330M, which runs at 2.2GHz, combined with 4GB RAM and a generous 500GB hard drive, a 6 cell battery offering decent battery life, all running on the reliable Windows 7 Home Premium (64 bit version). Finished in a stealth like black plastic, it looks sleek and stylish - read on for our B570E2 review. Below is our review of the Lenovo B570E2, a 15.6" laptop, featuring 4GB RAM, 500GB hard drive and Windows 7 Home Premium 64 Bit. The processor is the new Intel Core i3-2330M, running at 2.2GHz, which is pretty good considering the relative low price of this Lenovo laptop. Start up time seemed pretty quick, comparable to more expensive models we've tried. This is complimented by 4GB of fast DDR3 RAM. Connectivity: Lenovo have provided you with ample options including: card readers, 3 x USB, DVD drive, HDMI output, microphone, headphones, and ethernet. There is also a webcam included situated above the display, as well as the aforementioned DVD drive - both worked fine during our test period. The laptop's display measured the standard 15.6" diagonally, and provided decent performance - crisp picture and vivid colours, which you'll be able to adjust as required to suit your preferences and environment. Audio is catered for by a small set of inbuilt speakers - fairly good sound quality, although as with most laptops, you may wish to invest in a set of headphones for better audio quality. Battery life was good, at around five to six hours - you should be able to slightly tailor this to your needs by reducing screen brightness and not using the DVD drive if required. The B570E2 ran fairly quietly - the fan didn't come on that much during the test period - and the hard drive was pretty quiet. The hard drive in question provides 500GB of space - so more than enough for most users - and ran fast during the test. Finally, the keyboard and trackpad both were comfortable and accurate to the touch - again all in black, as per the rest of the notebook. This "Accutype" keyboard is designed to be comfortable for typing for long periods, and we had no issues with this aspect of the laptop. Design wise, the laptop seems well built, perhaps a touch thick, but we can make allowances for this considering the low price of this laptop. Predominantly made of plastic, it’s still pretty nice finish - in matte black - so shouldn't age or date too badly. Included in the box are the Lenovo B570E2 laptop, an AC adapter, a power cord, and a user guide. Pros: Pretty fast processor, decent screen, 4GB RAM, Looks good, and performs pretty well considering the low price tag. Cons: None to speak of - looks fairly understated, but performs well. To conclude - for the price, we can't complain - might not look as flashy as other models, but for the price there's little to quibble at.